Nan A. Talese, 9780385538619, 256pp. Rapier-sharp, witty, intriguing, and mysterious: a new novel from Peter Ackroyd set in the London of the 1960s. 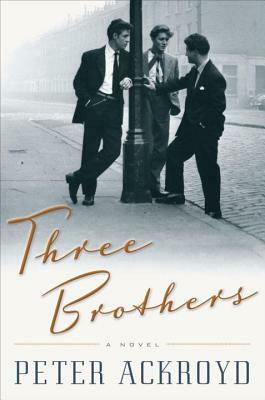 Three Brothers follows the fortunes of Harry, Daniel, and Sam Hanway, a trio of brothers born on a postwar council estate in Camden Town. Marked from the start by curious coincidence, each boy is forced to make his own way in the world—a world of dodgy deals and big business, of criminal gangs and crooked landlords, of newspaper magnates, backbiters, and petty thieves. London is the backdrop and the connecting fabric of these three lives, reinforcing Ackroyd's grand theme that place and history create, surround and engulf us. From bustling, cut-throat Fleet Street to hallowed London publishing houses, from the wealth and corruption of Chelsea to the smoky shadows of Limehouse and Hackney, this is an exploration of the city, peering down its streets, riding on its underground, and drinking in its pubs and clubs. Everything is possible—not only in the new freedom of the 1960s but also in London's timeless past. Peter Ackroyd is an award-winning novelist, broadcaster, biographer, poet, and historian. His novel Hawksmoor won both the Guardian Fiction Prize and the Whitbread Novel Award. His fiction includes The Lambs of London, The Clerkenwell Tales, The Trial of Elizabeth Cree and, most recently, The Casebook of Victor Frankenstein. He lives in London and was awarded a CBE for services to literature.